The U.S. Food and Drug Administration (FDA) has agreed to allow Mayo Clinic to use an automated bioreactor-based stem cell production platform on its campus in Jacksonville, Florida. This enables the Mayo Clinic Center for Regenerative Medicine to produce cells from the bone marrow of a stem cell donor in quantities large enough to make several doses that can be used as treatments in clinical trials. This automated stem cell production platform, capable of producing billions of stem cells in short periods of time, took more than four years to develop with continual oversight and evaluation by the FDA. This advancement will increase the production of clinical grade stem cells to the Florida campus, establishing it among the first automated stem cell manufacturing sites nationwide. Stem cells that come from bone marrow have been shown to have many applications, including immune system modulation, reduction of inflammation, and the promotion of healing in several tissues such as bone, heart and brain. 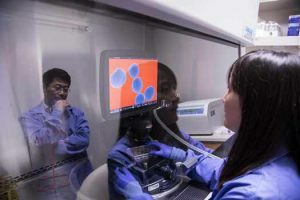 “The new platform represents a giant leap in regenerative medicine, in which stem cells currently are being investigated as treatments for wide-ranging medical conditions,” says Guojun Bu, Ph.D., a Mayo Clinic neurologist, who is associate director of the Mayo Clinic Center for Regenerative Medicine. Dr. Bu is the Mary Leary Professor of Medicine. Stem cell production has long been a labor-intensive process in which researchers cultivate hundreds of tissue-culture flasks over the course of months to produce enough cells for a few patients. However, the cells are needed on a large scale, such as for a recent Mayo Clinic clinical study that found infusions of stem cells to be safe for patients who have undergone lung transplants. Areas that Mayo Clinic researchers will advance the investigation of stem cell therapies include lung transplant rejection; chronic obstructive pulmonary disease; inflammatory bowel disease; and graft-versus-host disease, which is a complication of transplants.